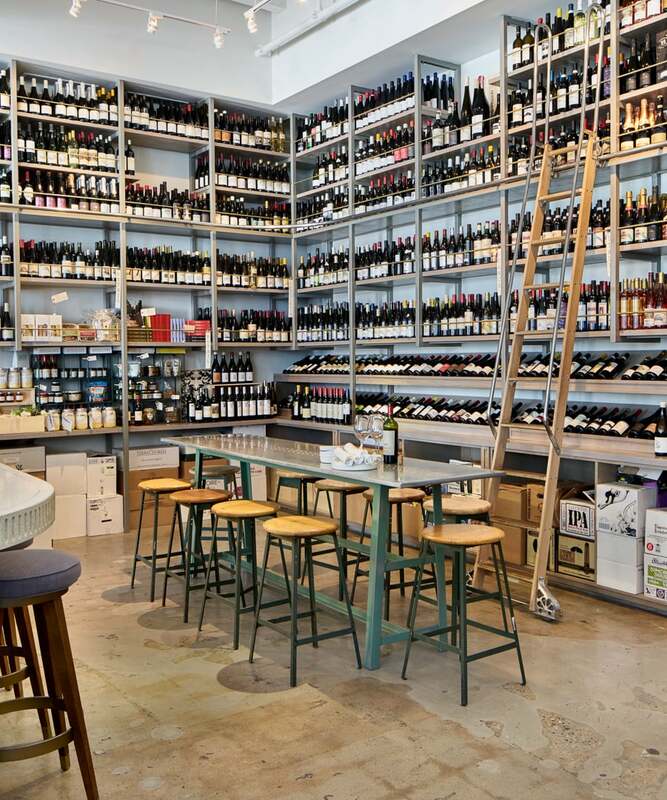 Located in downtown Santa Monica, Esters is a neighborhood bar and wine shop. Housed within a 1937 Art Deco building the intimate 1,600sf space seats 40 inside and 30 outside. The design combines raw materials and modern elements with an eclectic mix of new and vintage furnishings resulting in an elegant, timeless backdrop for showcasing an extensive wine selection. A large unfinished concrete column in the middle of the space serves as the anchor point for the design. Wrapping the column, the bar, inspired by the elegance of art deco details, comprises a decorative relief plaster front and a fluted opal, mirror and brass inlay terrazzo countertop. 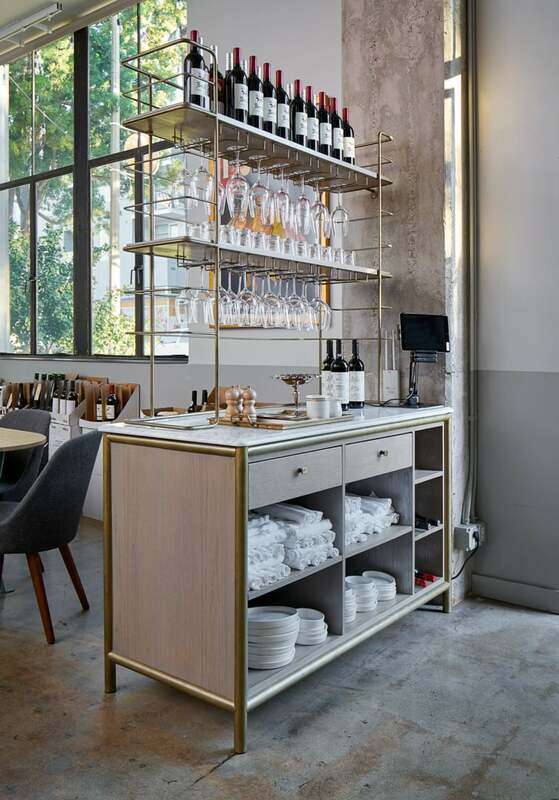 Wine displayed on simple stained oak and steel shelves line the perimeter, concealing kitchen and service areas. Repurposed steel frame windows left over from the building restoration enclose the wine cellar. 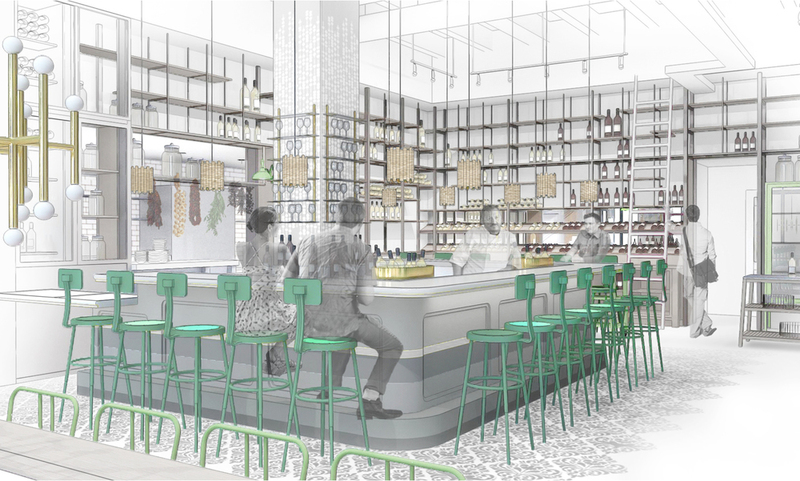 Furniture in the dining and retail areas offer a variety of dining and drinking experiences. Custom designed pieces in mixed metals, marbles and woods along with found pieces including the large beaded crystal chandelier and 1920’s industrial stools in the retail area create a relaxed, sophisticated atmosphere. A cozy nook adjacent to the wine cellar juxtaposes color and texture, furnishings and fabrics. Outside a shaded patio is carved out of a former loading dock on the sidewalk. Lined with fruit trees, patio seating includes comfy lounge chairs, teak wood benches and a custom steel and encaustic tile communal table.